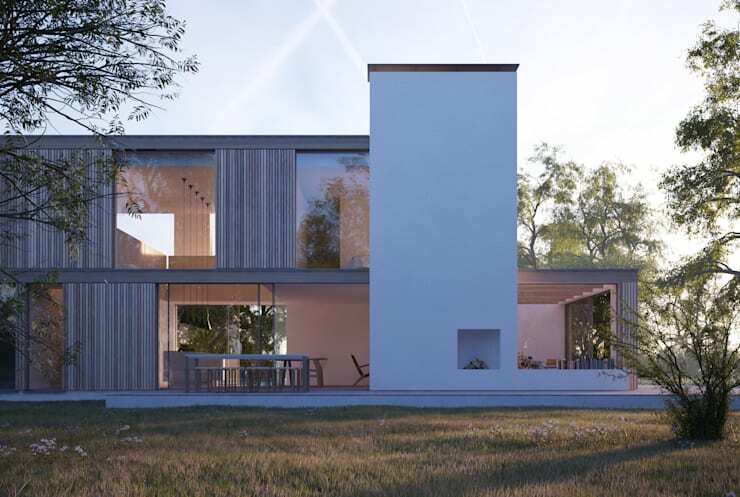 Today on homify we will take a look at an incredible project called Woodpeckers. 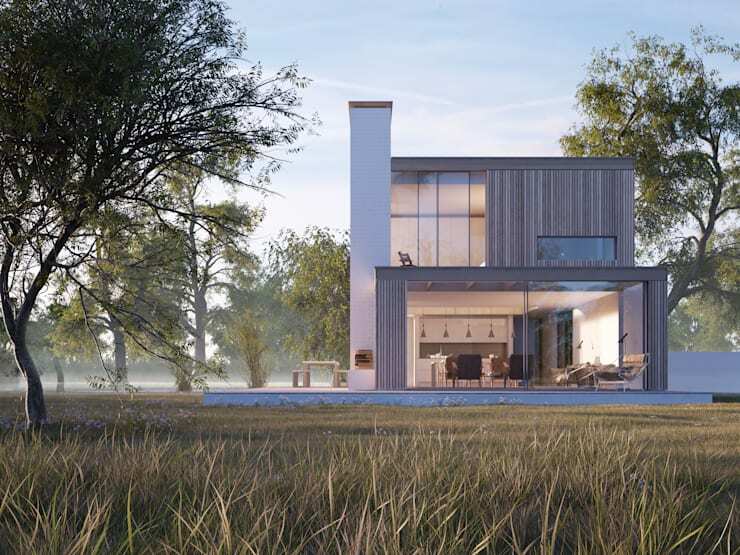 Built on a rural site to replace an older home, this modern house sits at the edge of a forest. Nearby, the National Park provides a beautiful backdrop for this holiday home. Replacement homes like this are tricky to build because they have to be built on the same footprint as the old house. This constrains the design and makes a tough job for the architects It can also serve as a creative driver for them to use their limited space to its best advantage. Take the windows for instance and see how they lie flat along the walls of the house with no overhang. They were designed like that because any overhang would count as square footage, thereby reducing the area they have to build the house. There are more surprising features to discover on our tour of this modern brick, glass, and wood home. Let’s learn more now and start our tour! The extensive glazing of the house is the first thing we notice when we see the house. Slim wood panels on the exterior frame the floor to ceiling windows. The house has plentiful outdoor spaces thanks to the terraces and the upstairs deck. Placed among the trees, the neutral colours of the house allow it to blend into the scenery. A simple wood frame structure allowed the prefabricated home to be built quickly and economically. 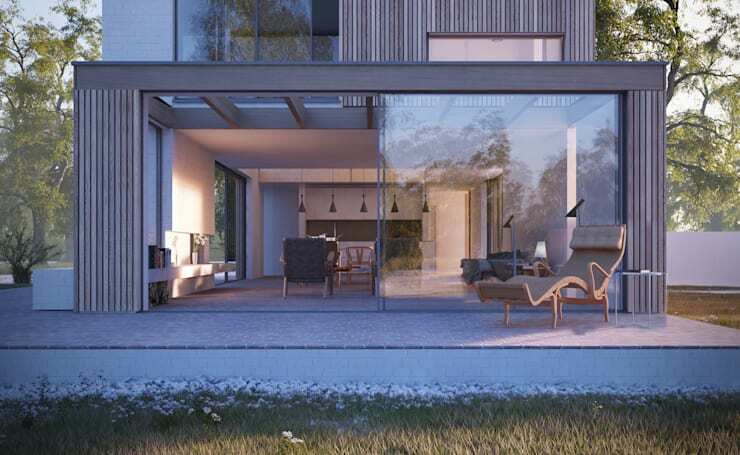 Prefab structures are perfect for a home built by the forest because off-site construction will not disrupt the natural surroundings. The home has a modern geometric design with prominent perpendicular lines and right angles. It sits on a platform that also creates outdoor terraces. A tower of white brick is the focal point for the home. This masonry chimney has fireplaces for the inside and outside spaces of the home. 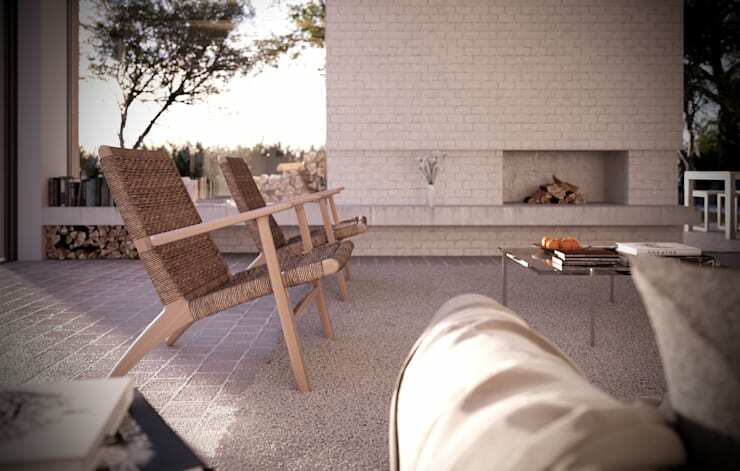 You can enjoy the warm glow of a wood fire from the terrace or from the living room. The double height of the main room is visible even from the outside. An expansive space like that inside a home helps to make even a small house feel airy and bright. Opening easily to the outdoors, the home welcomes fresh air inside. A lightly furnished deck allows one to take in the morning sun at their leisure. The snow white brick of the chimney and deck are clean yet homey. It’s a classic look that will withstand any trend. 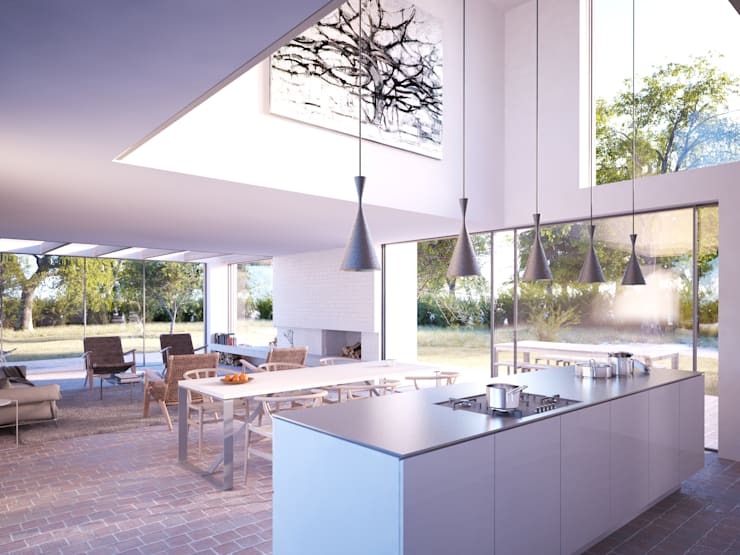 The main floor of the home is an open plan combining the kitchen with the dining and living areas. Above the kitchen there is an impressive double height space. Striking pendant lights hang from the ceiling above the kitchen, emphasizing the height of the room. Next to the expansive kitchen is living area with a lower ceiling that has become a cavernous and cozy spot. A minimalist kitchen island and bright white walls make this a modern space. The home is entirely done in elegant cool tones with a burnt rust brick floors add subtle character to the home. The low furniture gives the living room a casual feel. There is a narrow ledge along the far wall that extends to just in front of the white brick fireplace. This has become a flexible space that’s part bookshelf and part mantle. We love the neutral colour palette. The home freshens up its look by making use of natural textiles like the rug and the wicker chairs. Also a high pile rug can help keep the floor comfortable for you in the cold months. In this room, the views from the windows and the light from the conservatory make it as open as if we were outdoors. We hope you enjoyed our tour of the Woodpeckers house! If you’re inspired by prefab living among the trees, check out our feature on a home shaped like a tent in the woods. What do you think of this forest side home?